Yellow Ingestrie is an attractive old apple, and without doubt the perfect centrepiece for any fruit bowl. The apples have a rich fruity flavour. Please fill in the details below and we will let you know when Yellow Ingestrie apple trees are back in stock. Yellow Ingestrie is in flowering group 3. Yellow Ingestrie is self-sterile and needs to be pollinated by another tree of a different variety nearby. Since it flowers in the middle of the blossom season it can be pollinated by most other apple trees. As well as having pretty apples, Yellow Ingestrie makes an attractive tree for a large lawn. The branches have a spreading and slightly weeping habit. Raised by Thomas Andrew Knight, of Herefordshire, in about 1800. 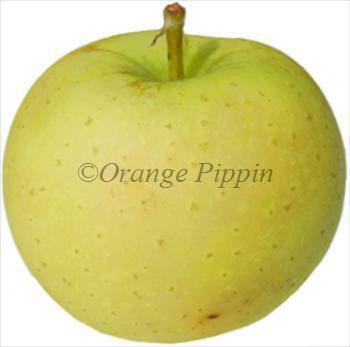 The parentage is Orange Pippin (not the same as Cox's Orange Pippin) and Golden Pippin.